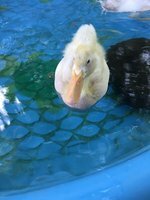 Discussion in 'Ducks' started by carlyducks, Jun 1, 2018. 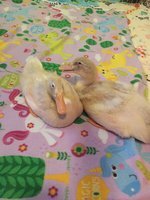 These are my two ducklings, Paige and Ethel. They will be 5 weeks old on Monday already! Time flies.. 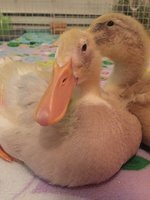 They are getting closer and closer to being able to live outside..
Ethel's legs had been shaking and trembling for about 2 weeks straight, she couldn't stand long and would just fall. They have gotten MUCH better and they look stronger each day. I think she just grew so fast and her legs needed to catch up. They are both doing phenomenal. Paige (Saxony) is sooo heavy and solid, she is going to be a big girl. 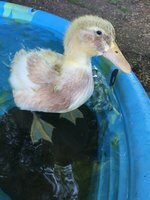 She is very confident and is extremely quiet, she hardly ever peeps.. Ethel on the other hand, already has her quack and is very loud and talkative! She always has something to say and tells me about her day every night. She complains how lazy Paige is and how she wouldn't run around and play with her while I was gone.. (Paige is very lazy and loves to lay down, while Ethel loves to run and does not stand still) hehe. You girls are loved so much! -P.S. Don't mind the guinea pig's pen in the background, the babies are living in their room until they move outside! They don't mind or bother each other at all. Miss Lydia, bantamsrmyfav, Soon2BChixMom and 5 others like this. I woulldve had those diarrhea machines outside 3 weeks ago! haha spoiled wrotten. 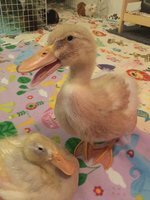 carlyducks, bantamsrmyfav, BullChick and 4 others like this. What are you feeding them? Is there food medicated??? If it is then the ducks are getting overly medicated and you should switch to a unmediated feed. Also are you giving them any form of niacin to make sure there legs are strong? If not you can buy a form of niacin call brewers yest off of amazon. BTW you are not behind in letting you ducks outside. Mine should have been out a month ago and we are slow at building a run for them. Good luck with you poopers!!! They are so cutie pies!!! casportpony, Julie Birb and Jpat like this. Love your cuties. Enjoyed your write up about their personalities. hahahaha, it will be bitter sweet when they go outside, for sure! And thank you!